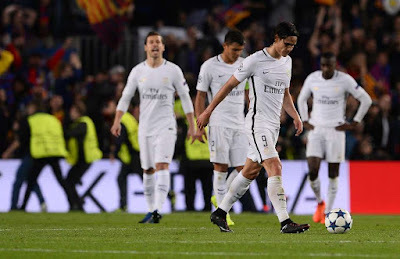 Paris Saint-Germain (PSG) stars have been accused of partying into the early hours with pop superstar, Rihanna, just two days before they were forced to eat the ‘humble pie’ in a 6-1 defeat to Barcelona FC. According to L ‘Equipe Journal, two PSG players – Blaise Matuidi and Marco Verratti were said to have been at a private nightclub in Paris on Monday night socialising with Rihanna – less than 48 hours before their Champions League thrashing in Spain. But their partying turned against them following the side’s capitulation at the Nou Camp which saw them give away a 4-0 first-leg lead to lose 6-5 on aggregate. According to L’Equipe, Italian international Verratti and French star Matuidi also turned up to the star-studded bash. The report says they stayed well after midnight, before linking up with their teammates on Tuesday to make the short flight across to Barcelona. While late nights are not banned, they are frowned upon by clubs too close to matches – with most putting in place a 48-hour curfew. Details about the pair’s night out have added further fuel to the anger in France at the way PSG caved in under pressure on Wednesday night. Rihanna had been in the French capital to star in a fashion show to launch her new range of clothing made by sportswear firm Puma. She was joined at the show by a host of top models and actresses, including Cara Delevingne and Salma Hayek as the Fenty range was showcased.